Meisburg lies 47 km. To the east of Prüm. 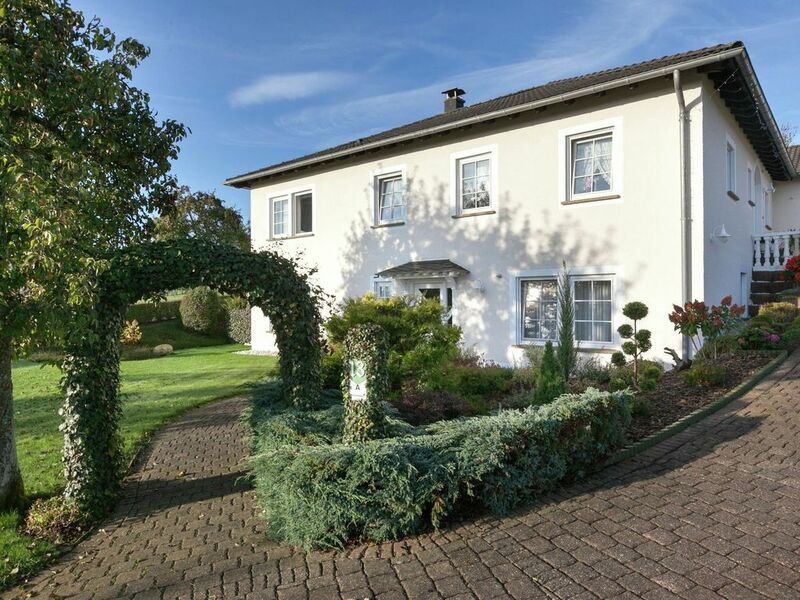 This beautiful, immaculate white country house is located on a hilltop in Meisburg. The very spacious accommodation 94 m) spreads out over the entire ground floor. The property is comfortable and modernly furnished. From the kitchen-diner you have access to the large terrace with garden furniture, garden. We found the apartment to be very well equipped, clean and spacious. The apartment is on the outskirts of a very quiet, peaceful village. Meisburg has a post box, garage with petrol pumps and a beer garden and there is a hotel\/restaurant just outside the village. We loved the peaceful situation and found our stay very relaxing. The lady who lives upstairs was very friendly but didn't speak any English and we only speak a very little German but we got by. The only minor point was my husband would have preferred a TV with a larger screen. There is a laptop provided with wi-fi which is a bonus. There are also 2 showers and a large bath. We enjoyed our stay here very much. We found this spacious apartment is a very pleasant, clean and luxurious accommodation situated in a beautiful garden with a lovely terrace. Plenty of resturants nearby (like Waldhotel Schafbrücke Meisburg itself) where you can eat well. Deudesfeld is a small supermarket in about 5 minutes away. This village is also an ATM. In Kyllburg you at Edeka supermarket good shopping. We hebben erg genoten van ons verblijf in dit grote en prachtige huis in Meisburg. De eigenaresse heette ons van harte welkom en gaf ons een rondleiding. Alle vertrekken waren ruim en hartstikke schoon. Een verrassing bij het slapen gaan waren de waterkussens die ons goed bevielen. Het terras dat bij de vakantie accommodatie hoort, lag beschut en was een heerlijke plek. Het huis was compleet en alles dat we nodig hadden was aanwezig. Onze complimenten aan de vriendelijke eigenaresse! Hartelijke ontvangst door mevr. Hardt. Een keurige en schone acomodatie. De omgeving is een paradijs voor de echte wandelaars. Wandelingen kunnen zowel vanuit huis als van vele andere startpunten in de omgeving worden gemaakt.